Star Trac treadmills are recognized worldwide for the reliability and unwavering durability of their treadmills. They are manufactured to endure rigorous use and specifically designed to meet the different needs of a user. Star Trac's attention to detail, feature and above all, quality are instantly obvious in their products. These treadmills are certainly some of the most expensive home exercise machines in the market today. But for the quality, specs and features you'll be getting, they have every right to price these machines the way they are. So, if you're in the market for a high-end treadmill, then this brand would not disappoint. Star Trac is not for everyone though. If you can afford to buy a commercial grade machine for home use, then acquiring a Star Trac won't be a problem. But for most of us, this puts Star Trac treadmills out of our reach. Star Trac claims to be the worldwide leader in the improvement and manufacturing of high-quality commercial exercise equipment, which consists of treadmills, elliptical trainers, stationary exercise bikes and stair climbers used in health clubs and fitness centers around the globe. The company introduced their first commercial treadmill back in 1974. Now they are globally recognized and more than 2 million people in over 65 countries use or have come across a Star Trac exercise equipment in fitness clubs, gyms and homes. Star Tracs definitely fall under the premium priced treadmill category. Most of these treadmills range from $3,000 up to $8,000. The most disappointing feature of Star Trac models are their parts warranty. They are only offering a 3 year warranty for parts which is way shorter compared to other brands in the same price category. In conclusion, I would recommend Star Trac treadmills for they are undoubtedly well built. Plus, they offer cool features and great product specs. If you're planning on buying a Star Trac, I recommend you buy your Star Trac treadmills from Amazon. 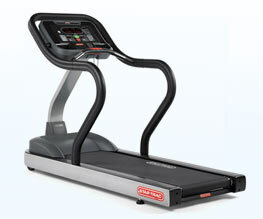 They sell both new and used Star Tracs as well as some remanufactured treadmill models. Click here to visit Amazon.com's Star Trac page. Others: This is one of the cheaper Star Tracs this year. But that doesn't mean the company sacrificed its quality. It is actually one of the best values you will find in a treadmill in the $5,000-$6,000 price range. Others: A huge and powerful treadmill which boasts of numerous features and the same excellent quality this company has been known for. Below are some of my reviews on older Star Trac treadmills that have been discontinued. I would keep these reviews here as some of these are still being remanufactured or sold on auction site. Others: this treadmill offers everything you would expect from a Star Trac treadmill built for home. Others: A huge treadmill that can be used for both home and industrial settings. Others:This machine is the entry level commercial treadmill from Star Trac. It is also one of the best values you will find below $4,000. Others:This treadmill is good but definitely far from great. Others: a commercial treadmill belonging in the high end of the Star Trac line. Have You Ever Used a Star TracTreadmill? If you're using or have used a Star Trac, chances are visitors of this site would love to hear from you. It's fun, free and easy to do. Once again if you plan on buying a Star Trac I suggest you get one from Amazon.